MEGADETH's Dave Mustaine will be pouring À Tout Le Monde beer at World Of Beer Avion Park in Tampa, Florida on Monday, March 4 between 9 p.m. and 11 p.m.
À Tout Le Monde is a collaboration between Mustaine and Unibroue brewmaster Jerry Vietz. Named as a nod to one of MEGADETH's songs and one of the band's biggest hits in Quebec, this beer recalls the consonance of Unibroue's flagship beer, La Fin du Monde. À Tout Le Monde is available in 12 oz. bottles (4-pack) at all Unibroue retailers in the United States, as well as on tap in various bars and restaurants. 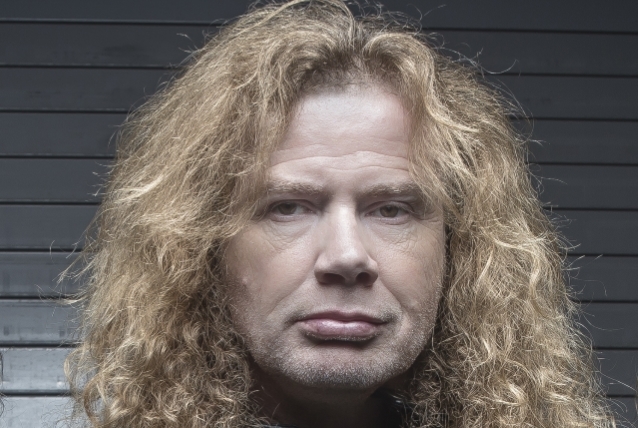 Asked when the first time was that he had a beer, Mustaine told Kilpop: "The first time I had a beer, I was really little — really, really little. Actually, my mom and dad got divorced when I was 4, so I was with my mom. And we lived in Huntington Beach and she worked many cities away, so she would commute from where she worked back to the house, and I came home from school and she would have beer in the fridge. But we were super poor, so it was those beer cans that were white and had the blue letters on it that said 'beer.' The only other beer I can remember at that period was Meister Brau, which was really another awful beer. So it was generic beer and Meister Brau back then, 'cause, like I said, we were really poor. And being of German heritage, beer is kind of like running water for me anyway." Regarding what he looks for in a good beer, Mustaine said: "Well, I'm kind of spoiled now with our beer, because we use the yeast only one time. Most beer makers, they'll reuse the yeast over and over again. And most batches will be anywhere from the first one to seven batches that they'll use that same yeast. And for us, it's very high quality, it's very crisp. We make sure that the date that when it's finished distilling to when it's packaged to when it's put into the marketplace, there's a timeline for that. Nothing is rushed. It's not about getting it out there and making mass production of this liquid. It's about making sure that… See, it's like art to Jerry. Jerry Vietz's the beer meister. So there's a lot of ties there. And when Jerry had said, 'I think we should call it À Tout Le Monde,' I was, like, 'Great. Whatever you call it, I just like how it tastes.'"